TJ's 1911 Series '80 to Series '70 Conversion Shims© (Frame Slot Filler) replace the gap used by the "Colt Series '80 Firing Pin Block Actuating Levers" when removed by gunsmiths for crisper trigger pulls. It is nessessary to fill this frame gap so the sear will not wander over and lock up the sear / trigger mechanism. Shim/slot filler fits in the frame cutout, permitting Series 70 slides and components to be fitted to Series 80 frames. No alteration, drop-in fit. Available in the standard .057” width, as well as .030”, .060” and .065”. TJ 1911 serien ' 80 serien ' 70 konvertering Shims © (ramme spor Filler) erstatte gapet brukes av "Colt serien ' 80 avfyring Pin blokk Actuating spakene" når fjernet av børsemakere for skarpere utløser trekker. Er det nødvendig å fylle dette ramme gapet så svi ikke vil vandre over og låse opp svi / utløse mekanismen. Mellomlaget/slot filler passer i rammen utskjæringen, tillater serien 70 lysbilder og komponenter skal monteres Series 80 rammer. Ingen endring, drop-in passer. Tilgjengelig i standard. 057" bredde, samt. 030",. 060 "og. 065". Spesifikasjoner: stål i det hvite. The .060 shim fit great in my Colt Competition 1911 45acp. I wanted to try the shim that was a tiny bit bigger than the standard shim size to fill the gap in a little better after measuring it with my calipers even though others said the standard size worked. Well the .060 shim fit great and filled the gap better so theres no rattle in the frame yet still works perfectly smooth. It dropped right in and dropped my trigger pull down to 3.5lbs. This is a great inexpensive part to convert your 80 series to 70 series for a much better trigger pull. I could not get it to blue so I just put a light coat of Slip2000 grease on it and put it in. This little part is totally worth it! This plate is the reason I never pass on a 1911 with an 80 series system. It takes no time to install and allows unneeded parts to be eliminated. this works as advertised. it is easy to install. it fit perfect in my colt government model. I also did notice a slight decrease in trigger pull weight. This was just a perfect drop in part! It made the trigger pull way smoother! And it's nice to have the option to switch the parts back out to the 80 system. Used on a Sig 1911 Scorpion Carry. It takes 10 minutes to install if you know how to detail strip and reassemble a series 80 1911. All pros, no cons. Allows you to get rid of some components that can potentially fail. Firstly this is a smokin' deal for a part that is so important. Installed on my Para GI Expert and Para Warthog. Improved the trigger immediatley! However the part should have the holes de-burred, and the metal looked raw, so I cold blued it and it took. Also the instructions suggest converting the slide first, which to me is like putting the cart before the horse. Make sure the piece fits your frame OK, then remove the plunger and spring from slide. I replaced the firing pin stop with stainless standard 1911 ones. Hope this helps! Best [$] to put in your gun!! I didn't like my trigger pull due to the whole firing pin safety plunger mechanism...this is the solution to that problem. Istalled in 5 minutes, immeditely improved my trigger. Worked exactly as advertised. Polished the edges and installed per the directions. It dropped right in. The GSG 1911 .22 is a nice gun filled with too many inexpensively manufactured parts with loose tolerances. It took many hours of hand fitting replacement parts to get it to cycle with cheep .22 ammo. The safety bits were not only useless but difficult to refit. The slot filler fits fine. Last item to add will be a ball head disconnector. sweet part kiss design,my trigger is smooth like silk now. brownells has ultra fast shipping, overall good experiance with the part and the company. This was a drop in fit for my Delta Elite. I ordered the standard 0.057-inch filler for my Auto Ordnance M1911A1 clone. I had to sand it down a bit and polish to make it fit and work smoothly. Took maybe 30 minutes total for teardown to reassembly. Having all the Series 80 junk out of the way lighten trigger pull a good bit, more crisp too. Definitely worth the time. I got the .057 size for my Auto Ordnance 1911A1. It was a simple "drop in" change. No fitting or filing needed. As I had heard, it did reduce the trigger pull by about a quarter pound. Since I use this gun for CMP matches, it was easy enough to tweak it back to just over 4 pounds. P14-45 and went in with ease. I deburred the edges as they were quite rough. Fantastic price for something you can feel a difference in. its not even w/ the frame like the original part. I've used these on three pistols, to rid them of their "Series 80 Infestation", and they're going into the rest of my Series 80-type guns. So far, I've used them on a Para P18 Pro Custom (lightened the pull by 14 oz); a Springfield Loaded Ultra Compact (17 oz improvement); and a Taurus PT 1911 (12 oz improvement). In addition to noticeably lightening the pull, the triggers, in all cases, feel crisper. They are easy to install (assuming that you're completely comfortable detail stripping a 1911), although you should measure to make sure that you order the correct thickness for your pistol. As others have noted, some polishing & de-burring may be required, and some finish (at least cold blue) is probably a good idea, since the shim isn't stainless and comes "in the white". If you're not comfortable doing it yourself, a competent gunsmith should be able to do it in less than 30 minutes. Overall, these are the easiest, least expensive, way that I've found to significantly improve the trigger on any Series 80 1911. Installation in to my 9mm series 80 Colt 1991 was very easy. If you can detail strip your series 80 1911 you can install this spacer. Trigger pull is down from 4.6 lbs to 3.5 lbs and it is crisper as well. All other safety functions are as they should be. It is described as steel in the white but Birchwood Casey cold blue had no effect on the metal so it's still in the white. I hope that corrosion won't be an issue. The only bummer is paying more for standard shipping than for the product. They could have put this tiny gizmo in a first class envelope and mailed it for 49 cents rather than that pesky UPS/USPS hybrid service that cost $7.95 and takes forever. 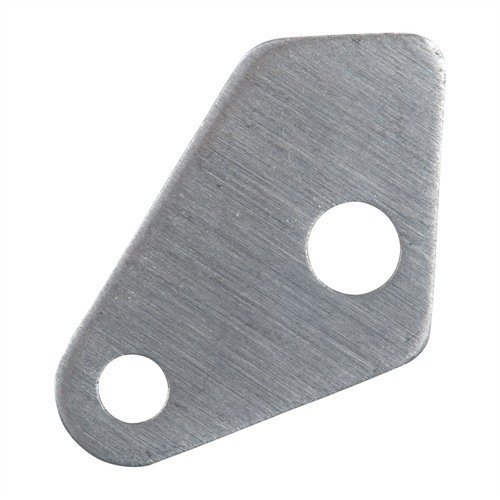 I used this shim in hopes of reducing the 6# trigger pull on a Colt Series 80 Government Model (in 9 mm Luger). The trigger pull was reduced to a crisp 4#; it worked marvelously. I used the standard 0.057"shim. After a little deburring and polishing was an easy install in a Remington 1911 R1. Turned a rough trigger pull into a smooth one. I hate that series 80 garbage. I'll give it 5 stars because it works and it is fairly easy to install. However I learned the value of a firing pin block this afternoon and put the original parts back in. Excellent product. I dropped it right in my Colt Competition 9mm in about 10 minutes. Didn't even polish it up, and it dropped my trigger pull from 5 to 4 lbs; also made the pull crisper. A couple years ago I bought a Colt .22 Conversion Unit (Series 70) on a Colt Series 80 frame. The previous owner simply cut the "arm" off the firing pin plunger lever in order to get it to work. I never liked this workaround so I replaced the Series 80 parts in the frame with this frame slot filler (I had it TiN coated) and it works perfectly. Now my gun works properly without any unnecessary parts. FRAME SLOT FILLER .060 TJ 1911 serien ' 80 serien ' 70 konvertering Shims © (ramme spor Filler) erstatte gapet brukes av "Colt serien ' 80 avfyring Pin blokk Actuating spakene" når fjernet av børsemakere for skarpere utløser trekker. Er det nødvendig å fylle dette ramme gapet så svi ikke vil vandre over og låse opp svi / utløse mekanismen. Mellomlaget/slot filler passer i rammen utskjæringen, tillater serien 70 lysbilder og komponenter skal monteres Series 80 rammer. Ingen endring, drop-in passer. Tilgjengelig i standard. 057" bredde, samt. 030",. 060 "og. 065". Produsentnr. : 1911SHIM 050806110335 Ramme spor Filler, Standard,. 057"
FRAME SLOT FILLER .030 TJ 1911 serien ' 80 serien ' 70 konvertering Shims © (ramme spor Filler) erstatte gapet brukes av "Colt serien ' 80 avfyring Pin blokk Actuating spakene" når fjernet av børsemakere for skarpere utløser trekker. Er det nødvendig å fylle dette ramme gapet så svi ikke vil vandre over og låse opp svi / utløse mekanismen. Mellomlaget/slot filler passer i rammen utskjæringen, tillater serien 70 lysbilder og komponenter skal monteres Series 80 rammer. Ingen endring, drop-in passer. Tilgjengelig i standard. 057" bredde, samt. 030",. 060 "og. 065". FRAME SLOT FILLER .065 TJ 1911 serien ' 80 serien ' 70 konvertering Shims © (ramme spor Filler) erstatte gapet brukes av "Colt serien ' 80 avfyring Pin blokk Actuating spakene" når fjernet av børsemakere for skarpere utløser trekker. Er det nødvendig å fylle dette ramme gapet så svi ikke vil vandre over og låse opp svi / utløse mekanismen. Mellomlaget/slot filler passer i rammen utskjæringen, tillater serien 70 lysbilder og komponenter skal monteres Series 80 rammer. Ingen endring, drop-in passer. Tilgjengelig i standard. 057" bredde, samt. 030",. 060 "og. 065".